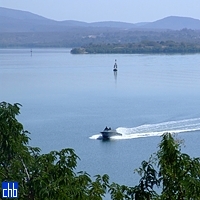 Caimanera Hotel is located like a castle on the highest hillock, in the fishing village of the same name, which is in the heart of the Bahia de Guantanamo, better known as Guantanamo Bay. The South of the village is actually bordered by the Guantanamo Bay US Naval Base. 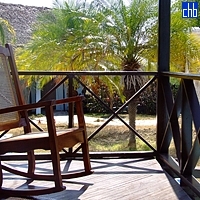 Hotel Caimanera with natural decorations and ambience is a model of simplicity and good taste. 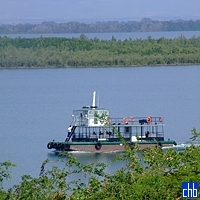 It is has been newly renovated for 2009. It looks great. 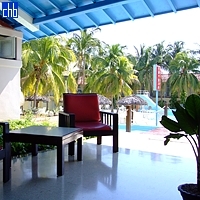 Offering excellent service and a historically unique location, it is the prefect setting for a memorable vacation in a truly warm Cuban carefree atmosphere, made all the better by the sheer irony of being so close to a culture so obsurdly opposite. The hotel has been closed to foriegners for many (Bush) years until February 2009. 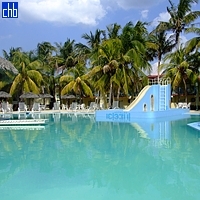 Now (for the moment) it is open again to foreign tourists from Cuba-friendly countries. 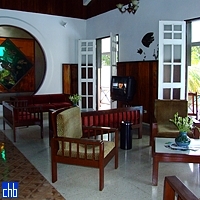 You must come in a group (7 to 40) with tour guide, and provide passport details of all visitors two weeks in advance. Also there is a LUNCH ONLY stop combined with a tour of Los Monitongos. 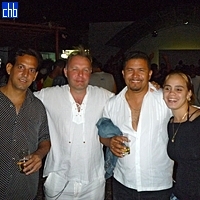 The guide and the tour are bookable with idelsis@cubaism.com. The security checks in the Caimanera zone are very tight for good reason, as you might expect. But it all adds to the excitement. It would be surpising if you didn't feel very special and privileged if you visit here in 2009. 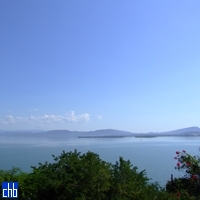 Guantanamo Bay is an exceptionly beautiful, natural and large subtropical bay surrounded by lush vegetation and ring of low mountains. To the West are the semi-desert "Los Cerros de los Monitongos" mountains. This is driest place in all of Cuba with a unique range of animal and plant species. 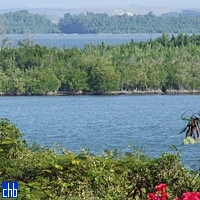 To the North East are the wettest mountains and the largest rivers in all Cuba. 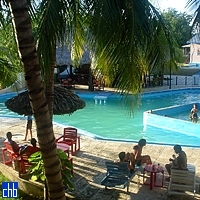 Caimanera is a fishing village and port of 10,600 people. Built on the West shore of the sheltered Guantanamo Bay, just North of the US naval base. The port ships chiefly salt, sugarcane and coffee. Residents of this remote, southeastern community of steaming, narrow streets and weathered wooden houses are the closest Cuban neighbours to the US military camp still filled with prisoners from the war on Afghanistan. The arrival of Taliban and al-Qaida prisoners added a new chapter to what Caimanera residents say is a long story of the town and a 45-square-mile piece of land seized by US troops in 1898. The Americans have remained, despite opposition from the Cuban government. Cuba did not initially oppose the holding of prisoners on its soil. "Thanks to the base, Caimanera grew,’’ said Ofelia Garcia, the community’s historian. "But it has also suffered much because of its presence. We have not been able to develop a normal life here.’’ The community of fishermen and salt mine workers flourished at the beginning of the 20th century precisely because of the base’s construction. 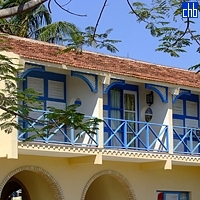 It was a magnet for Cuban workers and a popular spot for visitors, including Cubans from across the island and people from nearby countries such as Jamaica. The base, Garcia said, eventually had thousands of Cuban employees. Many American military officers and their families lived off base in Caimanera. That all changed in 1959 due to USA's hostile response to Fidel Castro's popular revolution. In a little less than three years, Cuban defense forces formed a military zone along the 17-mile perimeter of the American base, seen on this side as enemy territory. During that period, thousands of Cuban employees were fired or quit their jobs at the base, Garcia said. Many former workers left Caimanera, but those who stayed - and successive generations - learned to live with the watchtowers, the fences, and the proximity of mine fields around the U.S. installation. Until February 2009, several army posts on the road leading to Caimanera were open only to the town’s residents and their relatives. 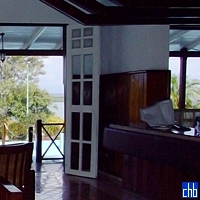 Now some foreign tourists that have authorisation are allowed to visit Hotel Caimanera for lunch. Staying overnight maybe possible sometime soon. The hotel was originally opened to forieign tourist in 1991 but that stopped once the last George Bush started warmongering. The community grew so poor that in 1985 Castro’s government ordered salaries here and in the nearby town of Boqueron to be raised by 30 percent to encourage workers to stay. Living so close to the base, Caimanera residents have (or had) access to the US military’s television programming, providing glimpses about the arriving prisoners that few have had. Judging by the number of prisoners and the space set aside to house them, "it must be pretty bad over there,’’ said Manuel Prieto, 73, a resident and former base worker. Lets hope that Mr Barrach Obama and his people appreciates the injustice of the unwanted occupation of Cuban soil. It is not like the Falklands or Gibraltar with a largely non-military population who want to stay British. In November 2003, international law expert Professor Alfred de Zayas, from the University of British Colombia, detailed the position of the US base in international law, and found that there are four main ways in which the lease and the treaty that created it can only be described as illegal: 1. The treaty was imposed by force, 2. The treaty was binding in 1903, but is illegal in the post-colonial age, 3. The terms of the lease have been broken, 4. The treaty breaks the rules of sovereignty. So now you know a bit, why not read up on it, at www.alfreddezayas.com for example, or better still come visit.. now you can.. well most of you.